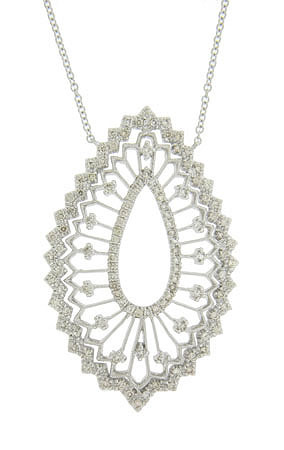 A lacy open filigree frosted with fine faceted diamonds forms the surface of this 14K white gold pendant necklace. The teardrop figure sprouts vines bursting with delicate flowers. The edges are pointed. A wide zig zag frame caresses the lacy teardrop. This spectacular pendant measures 1 3/4" long, 3/4" wide. The attached chain is 16" in length.